Made mini and bagged up so it is extra easy to snack on. Full of a rich Spanish flavour. We started unearthed® to share our favourite food discoveries with you, using authentic ingredients and the expertise of great regional producers. Click here to see our full range on Waitrose.com. 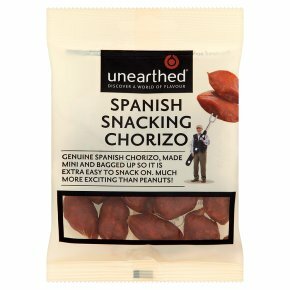 Genuine Spanish chorizo, made mini and bagged up so it is extra easy to snack on. Much more exciting than peanuts!